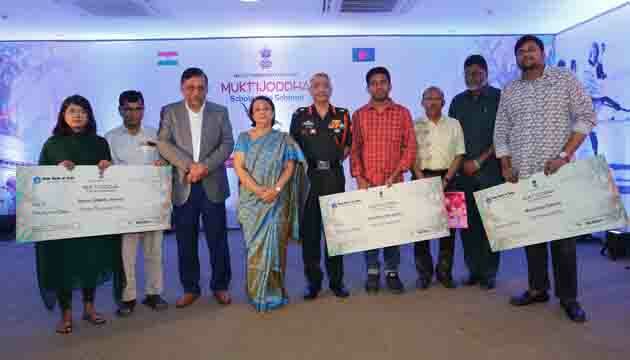 Each year the Government of India awards scholarship to descendents of Muktijoddhas to commemorate the invaluable contribution of the gallant Muktijoddhas towards Liberation of Bangladesh. A function was organised by High Commission of India on 19 Mar 2019 at its Chancery for scholarship distribution to the selected candidates. Hon’ble Home Minister of Bangladesh was the Chief Guest and GOC-in-C Eastern Command from Indian Army was the Guest of Honour on this occasion. Senior officers from Bangladesh Armed Forces, Muktijoddhas and senior bureaucrats from Ministry of Liberation War Affairs also attended the program. Two schemes are concurrently being implemented and up till now, 12,957 students have been awarded scholarship totalling Tk 23.66 crore. 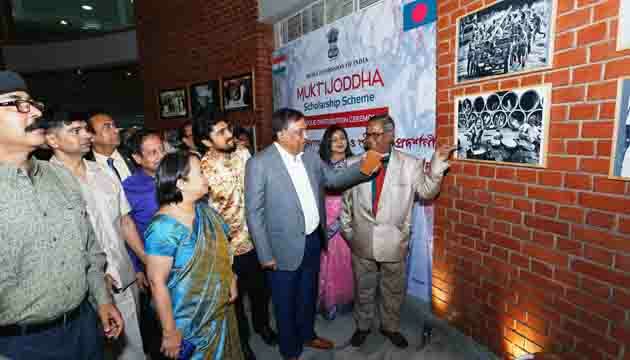 The ‘Muktijoddha scholarship scheme’ was started by Government of India in the year 2006 for the descendents of Muktijoddhas. Under the old scheme, Scholarships were awarded to Higher Secondary and Undergraduate level students. 11,336 students have benefited under this scheme till now and an amount of Tk 17.42 crores has been utilised for this purpose. Under the New scholarship scheme “Notun India Bangladesh Maitree Muktijoddha Sontan Scholarship Scheme” announced by Hon’ble Prime Minister of India Shri Narendra Modi during the visit of Her Excellency Sheikh Hasina, Hon’ble Prime Minister of People’s Republic of Bangladesh to India in April 2017, a total of 10,000 students will be awarded scholarships over the next five years and 35 crore takas will be utilised for this purpose. Each year, 2,000 students are being awarded scholarships – 1,000 each from Higher secondary & Undergraduate level. Higher secondary students are being awarded a onetime grant of Tk 20,000/- and those at Undergraduate level a onetime grant of Tk 50,000/-. This scheme has already been implemented from the year 2018. This year 2,200 students have been selected for scholarship under both New and Old schemes. Ministry of Liberation War Affairs has extended immense support to identify the students from all corner of Bangladesh. From this year onwards, the scholarship amount will be credited directly to the bank account of the student by the method of Direct Bank Transfer (DBT) in line with the Digital India initiative. 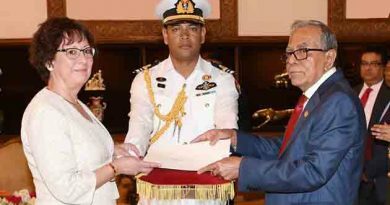 The United Kingdom will remain a partner in Bangladesh’s development journey says British High Commissioner in Dhaka Alison Blake.